What a cute and festive way to welcome the newborn baby girl with this delightful springtime motif. It�s a fun play wagon filled with premium quality necessities mom can use right away! This baby girl gift is sure to stand out as with its unique presentation. Meant to be used as a pull toy, this sturdy little wooden wagon is hand painted with six colored wheels and a whimsical plush caterpillar head and tail to stimulate years of creativity and fun. The wagon box measures a generous 10 by 22 inches, stands 10 inches high and meets all U.S. toy safety standards. Babies age 3 and under should always be supervised by an adult when playing with it. 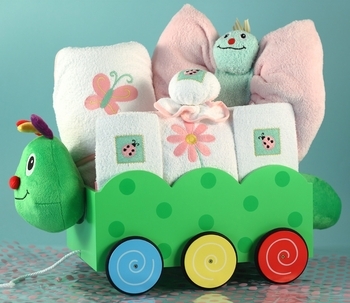 Within the wagon, you will find a blanket, hooded towel and more with pink or lavender accent colors adorned with little ladybug and butterfly embroidery. Each item included is manufactured in the USA using only American cotton materials. Please select the accent colors when ordering. You also have the option to personalize the side of the wagon with the baby�s name to make it even better! Click on More Images above to see a personalized wagon with lavender accents colors. The completed gift will arrive completely gift wrapped in white tulle for a beautifully finished presentation. Free shipping included.